Gardening needn’t be expensive. By recycling or repurposing waste materials you can save money while doing your bit to go green - one man’s trash really is another’s treasure! Read on for some ingenious ways to reuse so-called ‘useless’ materials, raid the recycling pile for gardening goodies and breathe new life into the old. Sowing is the easiest place to start recycling. Old yogurt pots are the perfect size for this purpose - just puncture holes into the base for drainage. Old fruit punnets make excellent miniature seed trays, while toilet paper tubes are ideal for starting off deeper-rooted vegetables such as peas, beans and corn. You can also sow rows of peas into surplus lengths of guttering. Polystyrene cups make fun-sized containers for kids to grow salad crops in such as radishes - make drainage holes by pinching holes out at the base of the cup. Even your daily read can be reinvented for sowing. Prepare a newspaper pot by folding one page in half lengthways before rolling it around a toilet roll tube so that the tube sticks out above the folded edge of the paper. Gather up and push in the loose ends of the paper, remove the tube then fill with potting soil. There’s no need to peel away the paper pot at planting time - it will just rot away in the ground. Make your own plant labels by cutting out strips of yogurt pot, or use lollipop sticks. Write on the labels with a permanent marker. Lengths of batten give a stylish, semi-permanent label, tailor-made for marking out the ends of rows. Many plants need protection from the cold and wind as they establish. Cut clear plastic drinks bottles in half and you’ll have two miniature greenhouses to pop over individual plants. Keep lids screwed on during cold nights or remove during the day to prevent the seedlings from overheating. Bubble wrap from postal deliveries makes fantastic temporary insulation on frosty nights, while polystyrene fish boxes sourced from fish sellers and restaurants provide a cozy microclimate around seed trays, especially when combined with a heat mat at the base. Old windows form the starting point for a home-made cold frame. Attach them to a wooden frame using new or second-hand hinges, then screw in handles at the front. Slant the window to face the sun. A lick of paint will spruce up the frame and gives a really professional finish. Once in the ground, crops can be protected from pests such as pigeons by draping netting over canes topped with upturned pots. Alternatively, dangle old CDs on colored string, or cover young squashes or other plants with hanging basket frames. Make a low tunnel for protecting rows of crops by pushing down lengths of old plastic water pipe onto sturdy upright pegs to create the hoops. Fix netting, fleece or mesh over your hoops. Anything that holds potting soil makes a good container…literally anything! Quirky pots include old pans, colanders, laundry baskets, chests of drawers - anything and everything, including the kitchen sink! 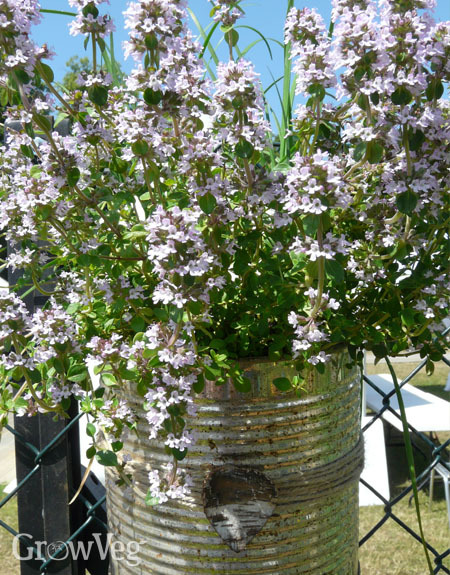 Metal objects such as repurposed milk churns, coal buckets or water tanks can create a lovely rustic look. Recycle food tins as they are, lightly accessorized, or painted to give an injection of color. As with any pot, you will need to make sure your intended container has enough drainage holes, or add your own. Use old potting soil sacks for root veggies such as carrots or potatoes, and enjoy a final crop from summer growing bags by sowing a flush of winter salads into them once your tomatoes or peppers have finished. Other ideas for recycled bag containers include sturdy grocery store bags, rubble or builders’ bags, and hessian sacks, which give a handsome natural look. Old planks of wood are widely available. They come steeped in character, are less likely to warp than new wood and by reusing them you’ll avoid the need to cut down more trees. Untreated wood is best, as some older wood treatments may contain toxic chemicals that can leach into the soil. Make a compost bin by nailing planks to corner posts, create a plant stand by securing timber onto A-frames, or screw battens together to form a crop protection frame. Make seed trays, fences, window boxes, or even the garden shed - the possibilities are endless! Timber makes excellent raised beds, insulating the roots and providing a handsome backdrop for your vegetables. Simply fix thick planks to each other or screw thinner lengths of timber to corner posts hammered into the ground to anchor the bed. Your creativity is only limited by your imagination. Any number of scraps and garden cast-offs could be assembled to create a handsome hotel for beneficial bugs. Tires lined with garbage sacks make instant raised beds and can be stacked up for vegetables such as potatoes that need lots of root space. Salvage old pavers to create stepping stones or paths between beds, or box in compost heaps with corrugated metal sheets. These are just a few ideas to make the most of what you have to hand. What do you recycle in the garden? Tell us by leaving a comment below - the more ingenious the better! "I've repurposed old clawfoot bathtubs as planters for deep root flowers, and used the ceramic bowls and tanks of toilets and sinks as ceramic planters. old bedframes make a surface to put feature plants on. I made wooden sidewalks of old wood so it is wheelchair accessible all thru the yard. I saved store tote bags and plant potatos in them, and plant vertically on old ladders so they can climb up. I use old clothes hang-type dryers for peas etc to climb up. " "Wow Louise - it sounds like you've been busy. Some really great ideas there, thanks for sharing them." "The best thing I've ever repurposed was the plastic I used over the greenhouse frame I made out of cattle panels. I cut in large sheets and wrap my Raised Beds around the peppers and tomatoes after transplanting to keep them warmer in May and Early June." "That's a brilliant idea! Many thanks for sharing."